After the pompous launch of one of the most anticipated phones of the year 2014, OnePlus One kept its calm and let its phone OnePlus One do the talking. You might have heard a lot of the OnePlus unless you are living on a different planet. It is quite rare for a 13 month old company to create such a buzz across the world! OnePlus One packs top-notch hardware at a fraction of the price tag of most of the current and last generation flagship phones from various popular manufacturers. It is currently available in India only on amazon.in via invite system and bears a price tag of Rs. 21,999 only. We have all been waiting to see their real numbers and and as one would anticipate, the results are jolly good for this young company. Unfortunately, OnePlus One did not give us the actual number of phones they sold. However, they have published their revenue numbers, which will give you an idea of number of phones they sold. Given their 300+ million revenue, one can guess that they have sold roughly 850,000 to 950,000 phones, which in our view is pretty good number for such a small and young company! Now, coming to India numbers, they shipped around 7% phones to India which means, around 60,000 to 65,000 phones have been sold in India! 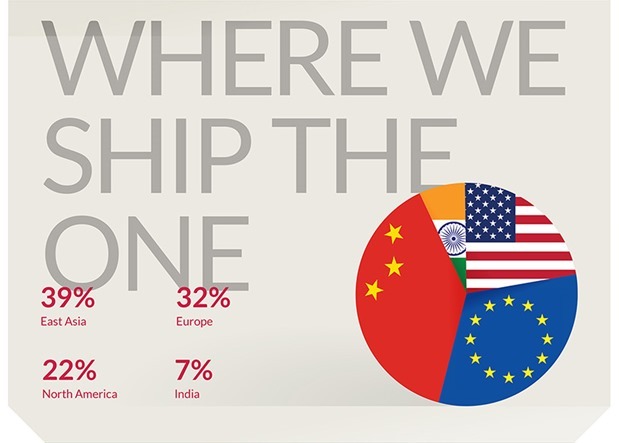 OnePlus One is extremely popular in East Asia, Europe, and the North America with the total shipments amounting to 39%, 32%, and 22% respectively. OnePlus launched One in these regions long before it made its Indian debut on 02 December 2014. And surprisingly India contributes to 7% of the total units sold. To give you an idea of just how popular the OnePlus One is, they have till date garnered a total of 100,000 social mentions and had 156k Google+ followers, 50k subscribers on YouTube, 190k Twitter followers, and about 1.1M Facebook fans till Dec 2014. 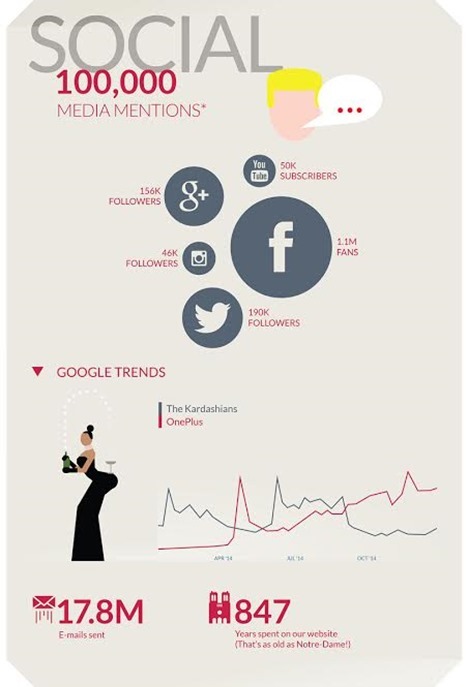 It even beat the Kardashians In Google Search trends! As outrageous as these numbers might sound, OnePlus fans spent quite a lot of time browsing OnePlus.net amounting to Eight Hundred and Forty Seven years. Even I visited the website innumerable number of times. The immensely active forum members of OnePlus generated a mind boggling 8.6 million posts. These posts are around various topics like software bugs and their fixes, feature requests, how to’s, user feedback, and many more. OnePlus employed 88 people from 13 different nations by the end of 2014. These employees worked at an average of 12 hours/day and didn’t even took weekly off on Saturdays. They also spent close to 10.8 million minutes (20.5 years) while answering support tickets. These numbers are enough to convince anyone of the success that OnePlus has been enjoying across the globe. Well, this is just a beginning and we wish them all the best for their future endeavours. You can check out the entire infographic here. Vodafone, Idea, Tata & BSNL Have The Most Unsatisfied Postpaid Customers.